Last week I showed you the Model T of RVs. Well, here’s the Cadillac of RVs. All of six of these were made in 1952, using a Cadillac commercial chassis, as used in all those hearses. Good choice, for back then. Good choice for today too! Just needs some steer horns on the hood. 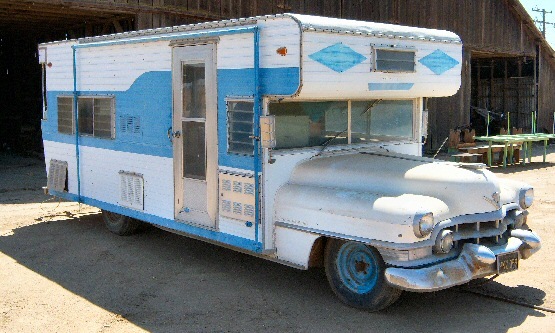 The RV part looks more 1960s than 1950s. I remember seeing one like this years ago in a magazine that used the front end of a 1964 Imperial. As early Motor Homes go, I Like it. The 52 Caddy has such an expressive fat “Santa Claus” face almost, it went with the Coca Cola hips I guess. It deserves to be animated. I Think I Can, I think I can! I do wonder how those (sp.) Challussy windows sounds rolling down the road at 35 mph much less 50+. I wonder how often then fell out and crashed into so many pieces. Jalousie windows? Wow, you’re right. Intriguing…there was something that looked like that Caddie for sale on trademe last month – except with an early-50s Chev front end. I thought it was home-built, but having seen the Caddie above, I can see now it possibly wasn’t. Wish I’d paid more attention now! Gateway CO, there is one. One of the six?? It is on the main drag next to an old brick store. I always thought it to be a kit of some sort but the commercial chassis makes sence now. But perhaps there was more than one coach builder of these. Interesting and it doesn’t look too half bad for an oldie! I hope the interior of the camper itself is original and in halfway decent shape. The Winnebago may have been the spiritual Model T of RVs, but the Ford House-Car was a lot closer to being the literal Model T of RVs. 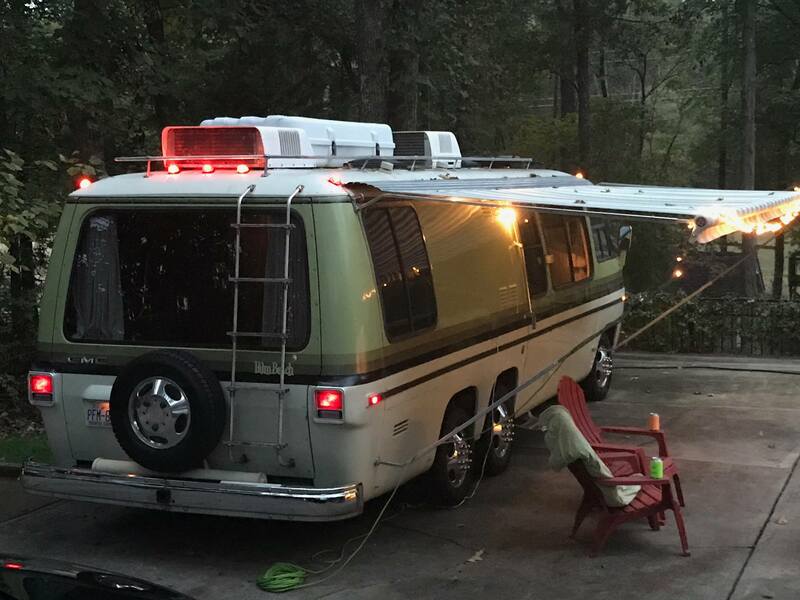 I see nothing of the GMC motorhome 1973-1978, that was the greatest motorhome of all time, IMO.